Comments Off on What is a Template? A Mad Mimi template is a pre-designed starter page that you can use to efficiently promote your product, invite people to an event, compose a newsletter, or send out a quick update. If these templates don’t offer a layout you like, you can customize a template to meet your needs, or you can create a new campaign based on an existing one. To open the template gallery, in the Campaigns tab, click Compose! To get a better idea of how each pre-designed template might look with text and images, hover over the Examples below each template design type. There are two examples for each template design type. 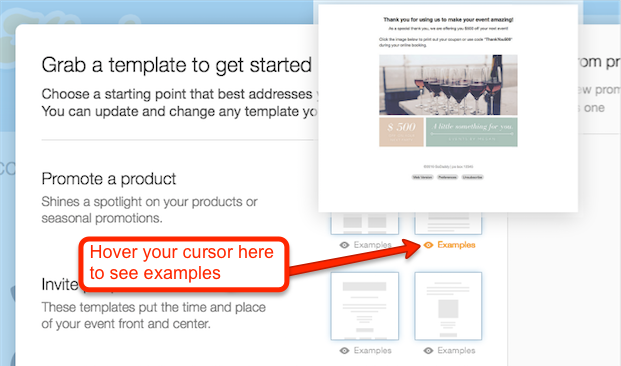 Pick a template layout, and then add your text and images to the placeholders.